"reports were brought to our attention alleging inappropriate behavior on the part of Mahanidhi Swami on both a personal and philosophical level. The GBC began an investigation of those and found some of the allegations to be true, including inappropriate interactions with a female disciple. Although the extent of those problems is not clear, we found there was definitely behavior not befitting someone in the renounced order of life. It was during this investigation that Mahanidhi Swami chose to resign." "Yet it should be clearly understood that if such diksa or siksa gurus deviate from strictly following, they may fall down from their position." Thus, the GBC admits that the gurus it is providing are actually defined as being "flip-flop" gurus. That is, they can flip to becoming deviants at any time. In contrast, as we see below, Srila Prabhupada specifically asks us to seek out a guru who is not a flip-flop guru, but a fixed guru -- one who will never become a deviant. All emphases have been added. "The spiritual master must never be carried away by an accumulation of wealth or a large number of followers. A bonafide spiritual master will never become like that. But sometimes, if a spiritual master is not properly authorized, and only on his own initiative becomes a spiritual master, he may be carried away by an accumulation of wealth and large numbers of disciples." Srila Prabhupada makes it clear that the authorised guru will never become deviated. Therefore, by stating that their gurus are personalities who may become deviated, the GBC is also admitting that their gurus are unauthorised. "The bonafide spiritual master always engages in unalloyed devotional service to the Supreme Personality of Godhead. By this test he is known to be a direct manifestation of the Lord and a genuine representative of Sri Nityananda Prabhu." "The prime symptom of one who has become a spiritual master in disciplic succession is that he is one hundred percent fixed in bhakti-yoga." "If someone is one hundred percent engaged in the service of the Lord, he is to be understood as liberated." "A Spiritual Master is always liberated." "God is always God, guru is always guru." In contrast with the GBC guru who may flip from being a "guru" to becoming a deviant, the bona fide guru will always remain fixed as a guru. And, in the next section, Srila Prabhupada states that it is this fixed, bona fide guru, whom we must accept. "The guru must be situated on the topmost platform of devotional service. There are three classes of devotees, and the guru must be accepted from the topmost class". "There is no possibility that a first-class devotee will fall down." "The conclusion is that one cannot become a spiritual master unless he is a pure devotee of the Lord. [...] One should therefore take shelter of a bona fide spiritual master." "The pure devotee is always free from the clutches of maya and her influence." "That is the business of spiritual master. He gives the right information; therefore he is respected so much, because he does not cheat. [...] Ordinary human being, he'll cheat you, or he'll give some information, he's cheating. But a guru, real guru, he'll not cheat you. [...] He does not cheat. That is the test of guru." Prabhupada: "[...] So the imperfect person is prone to become a cheater. So we should not take knowledge from the cheaters. What do you think?" Svarupa Damodara: "We should take knowledge from Krsna." Prabhupada: "Yes." Svarupa Damodara: "And Prabhupada." Prabhupada: "Yes. Prabhupada is giving you the same knowledge, that's all. There is no question of cheating. I have received this knowledge from Krsna, and you take this. That's all. My business is finished." Srila Prabhupada states that the whole purpose of accepting him as the spiritual master is that, unlike an ordinary human being, he will never cheat the disciple. Whereas, the GBC are stating at the outset that their gurus can go on to become cheaters! We are offered two starkly different visions of guru. Srila Prabhupada tells us to accept a guru who is authorised, always 100% fixed in Krsna consciousness, who will never deviate or cheat. 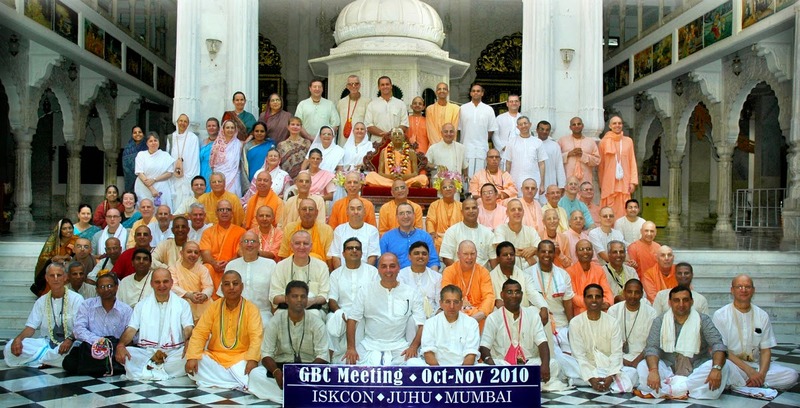 The GBC, however, offers unauthorised gurus who may flip to become deviants and cheat. The fixed guru whom Srila Prabhupada tells us to accept is available to everyone today; his name is Srila Prabhupada. We should therefore follow Srila Prabhupada's advice and accept only him as the spiritual master and reject the flip-flop gurus.